Receiving subscription boxes every month can be a ton of fun! Not only are you getting a collection of new items in each shipment, but you honestly never know what's going to show up. 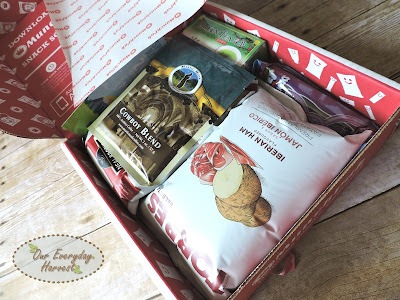 Last year, I introduced a subscription box that we really enjoyed called MunchPak. If you are a foodie and/or enjoy trying different types of treats from all around the world, then MunchPak is one that you may be interested in. 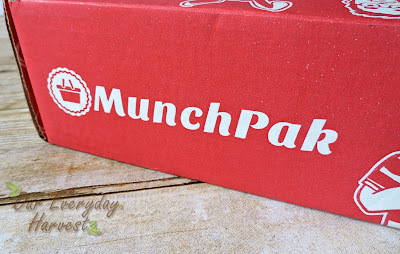 I'm all about taste testing new foods, so when I was previously offered the opportunity to try a MunchPak FamilyPak, I couldn't resist. We had received all kinds of sweet and salty snacks from not only the United States, but from places like Bulgaria, Turkey, and even Germany. 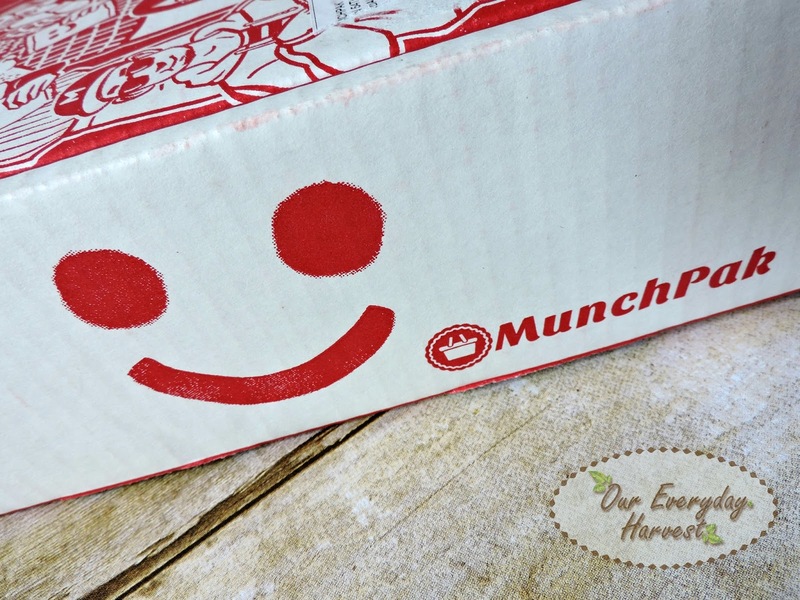 Today, I'm back to share the contents of our latest shipment in the Original MunchPak. 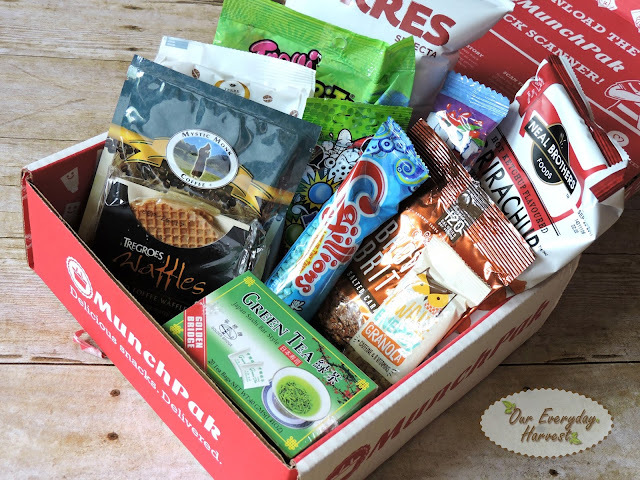 While not as large as the FamilyPak, the Original MunchPak offers over 10 unique treats from around the world. We even received a few additional beverage options in ours! 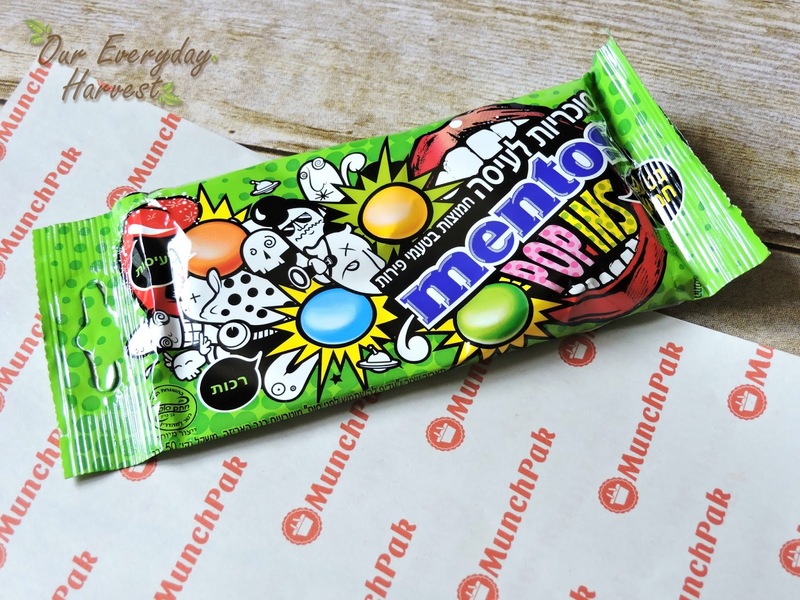 One of the things that I like about the MunchPak (in addition to the yummy treats) is that you can actually customize it to your liking. You first start off by picking which size you want (5+, 10+. or 20+ snacks), and how often you'd like it shipped. There's the option of having it sent out weekly, every two weeks, or monthly. For an additional fee, you can choose your favorite types of snacks, whether it's salty, sweet, chips, cookies, meat, candy, gummy, etc. This is an optional feature that's nice for those who may be picky about their snack choices or have a specific food allergy. You even have the option to add a beverage. One of my other favorite things, is that that you can also buy individual snacks. 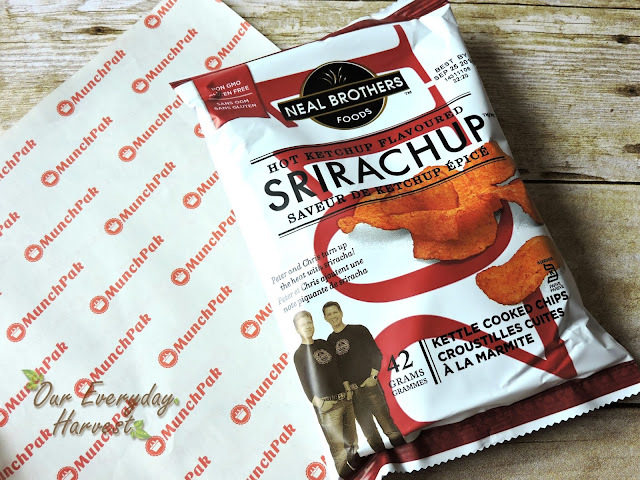 So let's say you really like a particular brand of chips from a previous shipment, you can conveniently purchase it from the MunchPak website. Mentos Popins Sour Fruit Flavor from the Netherlands: I'm usually not a huge fan of sour candies. While these tasted good, they were still a little too tart for my liking. My husband did enjoy them, since he actually likes sour candy more than me. The nice thing is that these don't contain artificial dyes, which is something I really appreciate, since I try to stay away from them whenever I can. 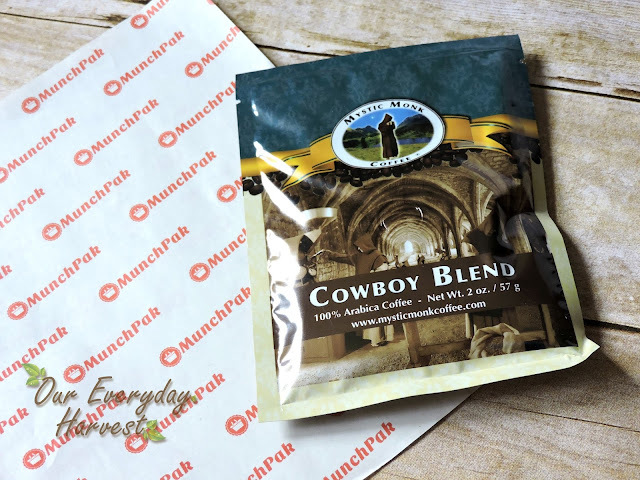 Mystic Monk Cowboy Blend Coffee from the United States: I had honestly never heard of Mystic Monk before receiving this, but I am a huge coffee drinker and always looking out for the latest and greatest cup of java. I really liked this blend–it offered a nice rich, bold flavor. I would definitely purchase this brand of coffee in the future. Neal Brothers Srirachup Chips from Canada: These were very flavorful and I really enjoyed them. 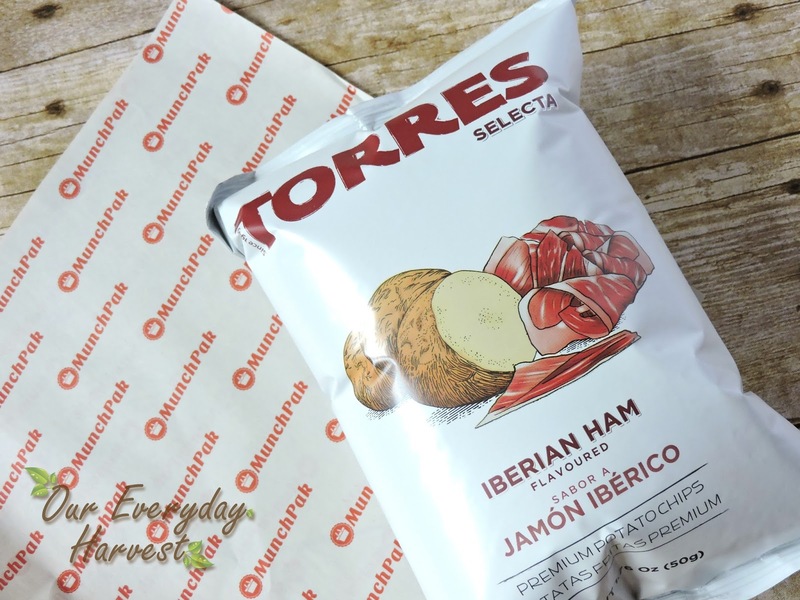 If you're looking for a salty snack that packs a little kick, then you should give these a try. Just be sure to have a glass of water nearby. 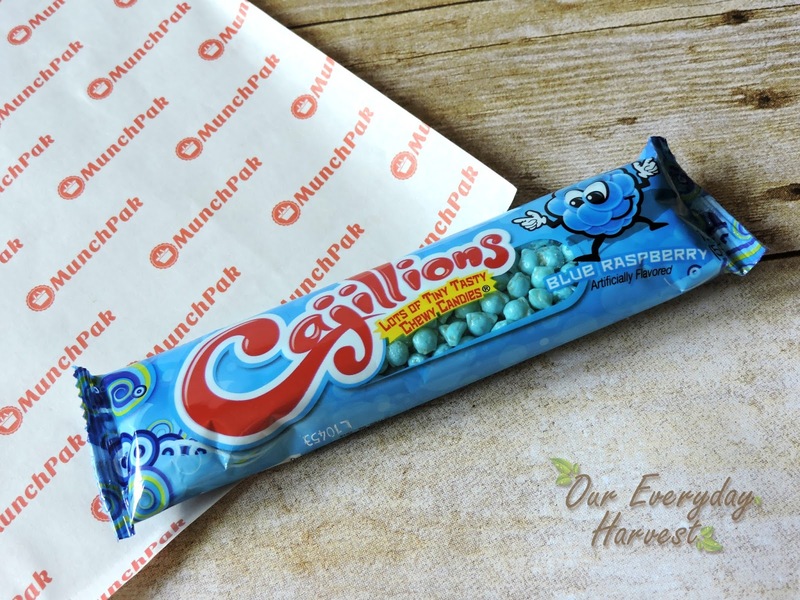 Cajillions Blue Raspberry from China: These look like Nerds candy, but they're chewy and way less tart. I try to stay away from artificial dyes when I can, but I did give some of these a try for testing purposes and they were really tasty. Golden Bridge Green Tea from Taiwan: I love green tea! It's full of antioxidants that can fight off free radicals and even aids in digestion. 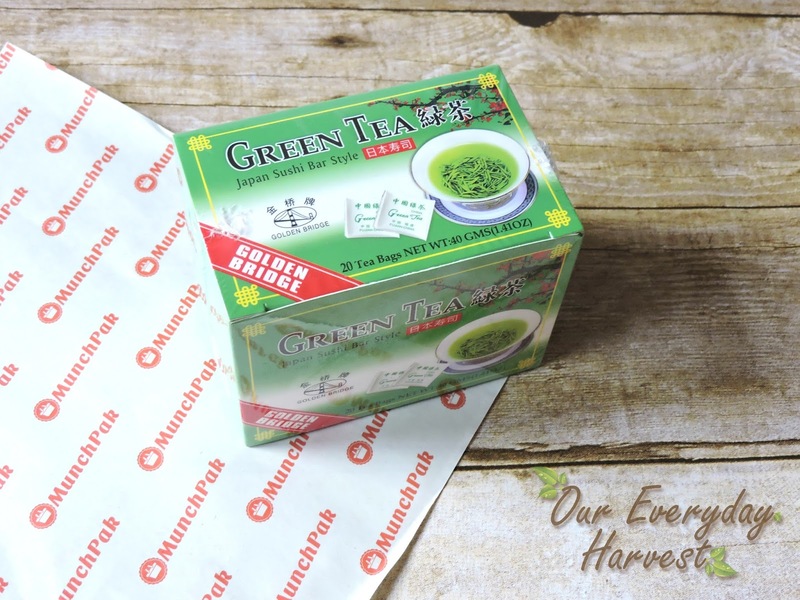 This particular brand wasn't bitter like some other green tea brands that I've tried in the past. In fact, it was really flavorful and one that enjoyed quite a bit. Coffeeralli Taralli Al Caffee Cookies from Italy: These were interesting. They're light and airy cookies that have a slight coffee flavor. While I enjoy coffee, I'm not a big fan of coffee flavored snacks, but these were actually pretty good. 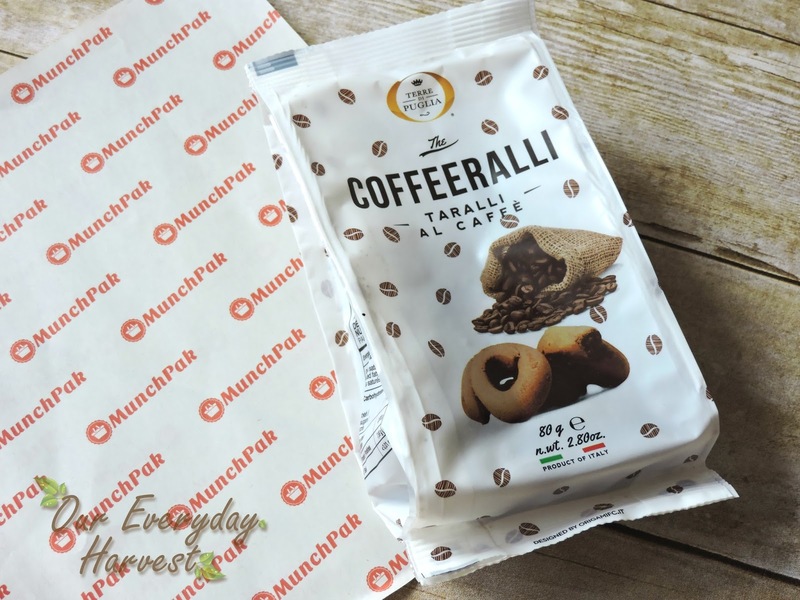 They are made with real coffee, so the only thing that was a little strange, was the fact that I would sometimes bite into a few small coffee grinds while eating these. Torres Selecta Iberian Ham Chips from Spain: I'm not going to lie, I was a little scared to try these at first! As I suspected, they were extremely salty, but oddly enough, tasty all the same. I wouldn't make a habit of eating these, due to the high salt content, but they were fun to try. They have a slight kick to them and almost remind me of a mix between an original and BBQ flavored potato chip. Tregroes Butter Toffee Waffles from the United Kingdom: If you have an extreme sweet tooth, then you may like this. 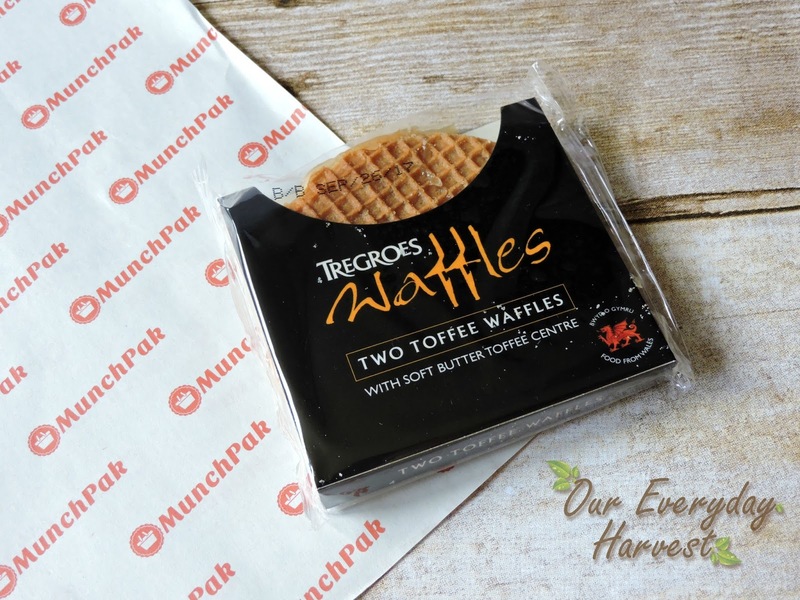 It's basically a layer of gooey toffee sandwiched between two thin waffle cakes. They were pretty tasty and quite good with coffee. 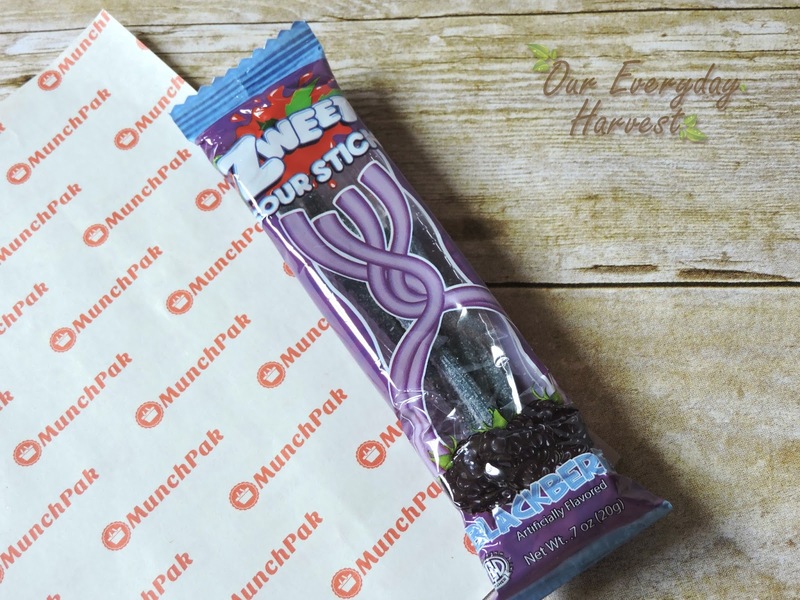 Zweet Sour Sticks from Turkey: If you like licorice that has a sour twist, then you may like these. I love licorice, but unfortunately these were a little too sour for my liking. 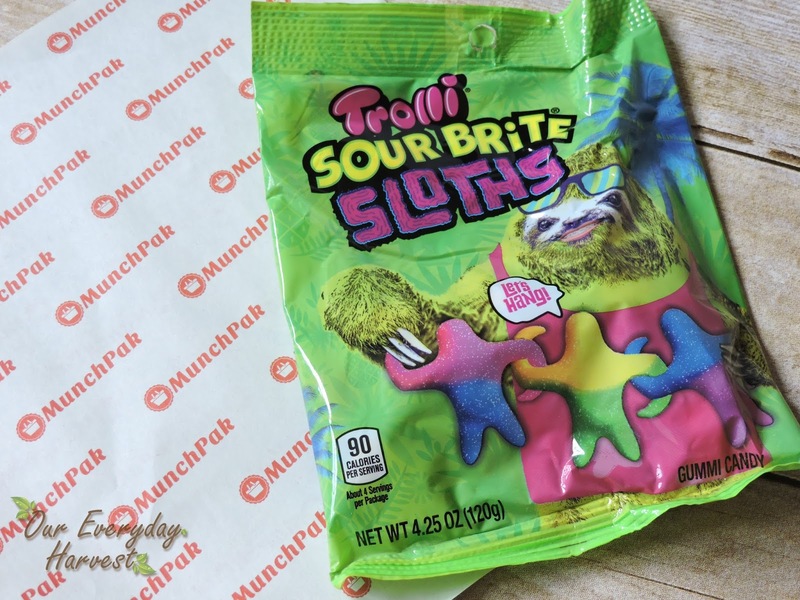 Trolli Sour Bright Sloths from the United States: Okay just the packaging alone had me cracking up. While I am familiar with the Trolli brand, I've never seen sloth shaped candy, before, and thought these were actually quite cute! Again, I'm not keen on eating things with artificial dyes, but did try some for testing purposes and they were tasty. There are several different flavors that come in the bag, and they weren't terribly sour, either. 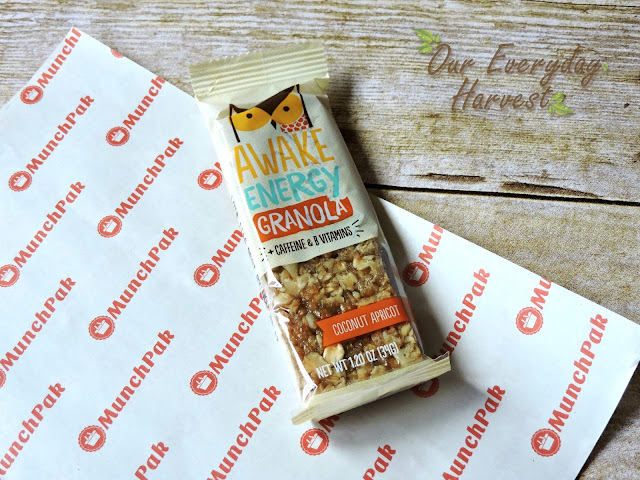 Awake Energy Coconut Apricot from Canada: I love granola bars, so seeing this added to my MunchPak was a nice surprise. I don't recall ever trying a caffeine infused granola bar, before. I ate this in spurts, so I can't comment on the energy aspect, but it definitely tasted yummy. I enjoy anything with coconut, and there was plenty of it in each bite. 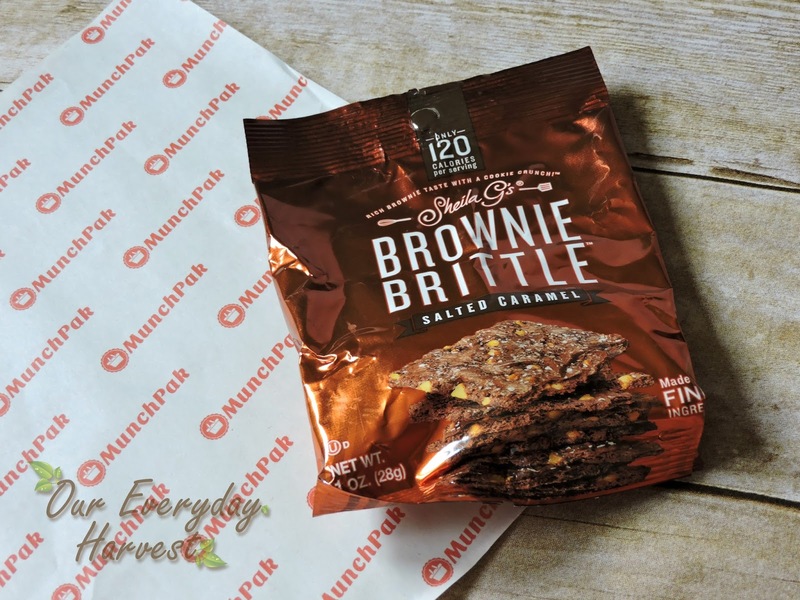 Sheila G's Brownie Brittle Salted Caramel from the United States: Our last MunchPak had a bag of Shiela G's Browie Brittle in the Chocolate Chip flavor, so I was excited to see another one packed in the latest shipment. This time we received the Salted Caramel flavor. Caramel and I have a love-love relationship, so it's no surprise that I like this one even better than the last. I am just glad that the "salted" aspect was toned down, so it had more of a traditional caramel flavor. 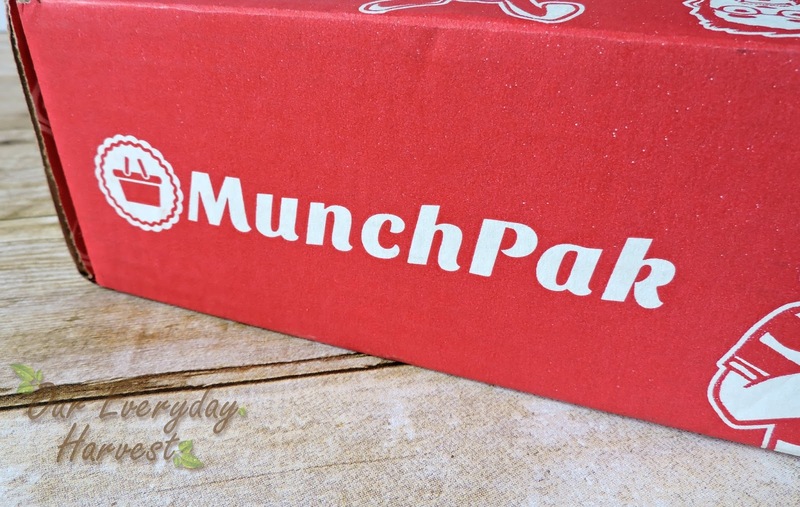 Since the MunchPak can be fully customized, it's suitable for all types of budgets. The cost of each shipment all depends on several factors like the size and how often you want it sent out. A pay per month plan can start as low as $12.95 per delivery, but if it's something that you know you're going to want on a regular basis, then you can lock yourself in a two, six, or twelve month plan to receive a discounted rate per month. Plus, standard shipping is always free! 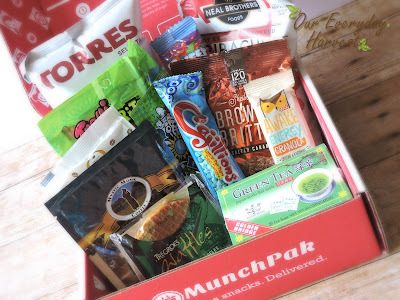 What I really like about the MunchPak is that it makes snacking quite an adventure, since you get the chance to try all kinds of treats from around the world. You may see some familiar brands, but will definitely be introduced to several new ones. Some snacks may be more appealing, while others will prove to be quite different, but still intriguing nonetheless. If you're feeling adventurous, why not give MunchPak a try? Who knows what you'll find in your next shipment! 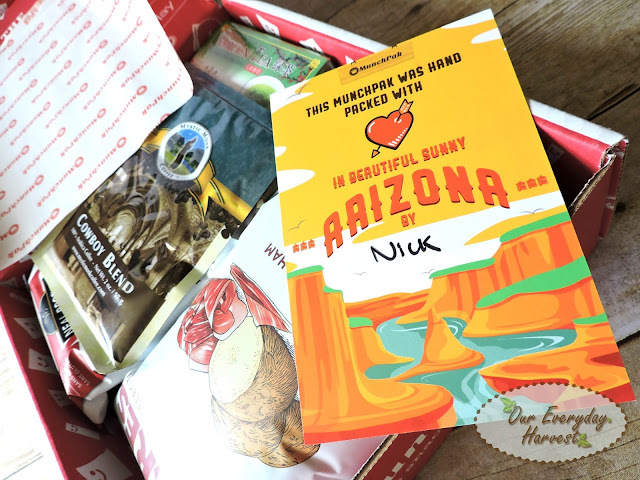 Our Everyday Harvest readers can also receive $2.00 off their first box! 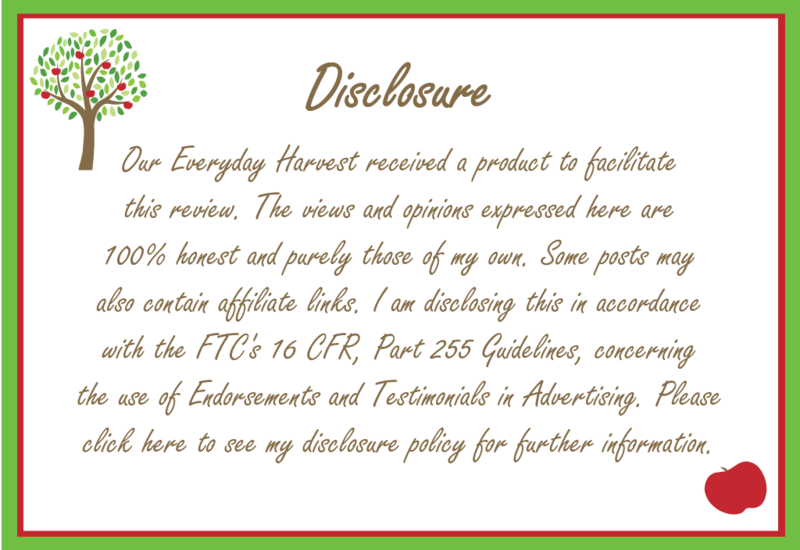 Just enter promo code OEHARVEST at checkout.